The Battle of Tsushima (Russian: Цусимское сражение, Tsusimskoye srazheniye), also known as the Battle of Tsushima Strait and the Naval Battle of the Sea of Japan (Japanese: 日本海海戦, Nihonkai-Kaisen) in Japan, was a major naval battle fought between Russia and Japan during the Russo-Japanese War. It was naval history's only decisive sea battle fought by modern steel battleship fleets, and the first naval battle in which wireless telegraphy (radio) played a critically important role. It has been characterized as the "dying echo of the old era – for the last time in the history of naval warfare ships of the line of a beaten fleet surrendered on the high seas." Prior to the Russo-Japanese War, countries constructed their battleships with mixed batteries of mainly 152 mm (6-inch), 203 mm (8-inch), 254 mm (10-inch) and 305 mm (12-inch) guns, with the intent that these battleships fight on the battle line in a close-quarter, decisive fleet action. 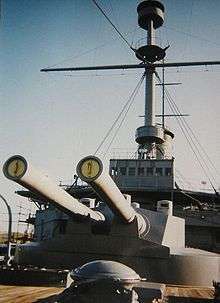 The Battle of Tsushima conclusively demonstrated that battleship speed and big guns with longer ranges were more advantageous in naval battles than mixed batteries of different sizes. The wireless telegraph had been invented during the last half of the 1890s, and by the turn of the century nearly all major navies were adopting this improved communications technology. Nonetheless Tsushima would be "the first major sea battle in which wireless played any role whatsoever." Alexander Stepanovich Popov of the Naval Warfare Institute had built and demonstrated a wireless telegraphy set in 1900, and equipment from the firm Telefunken in Germany was adopted by the Imperial Russian Navy. In Japan, Professor Shunkichi Kimura was commissioned into the Imperial Navy to develop their own wireless system, and this was in place in many Japanese warships before 1904. Although both sides had early wireless telegraphy, the Russians were using German sets and had difficulties in their use and maintenance, while the Japanese had the advantage of using their own equipment. On 8 February 1904 destroyers of the Imperial Japanese Navy launched a surprise attack on the Russian Far East Fleet anchored in Port Arthur; three ships – two battleships and a cruiser – were damaged in the attack. The Russo-Japanese war had thus begun. 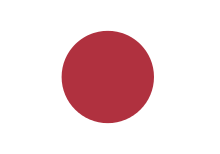 Japan's first objective was to secure its lines of communication and supply to the Asian mainland, enabling it to conduct a ground war in Manchuria. To achieve this, it was necessary to neutralize Russian naval power in the Far East. At first, the Russian naval forces remained inactive and did not engage the Japanese, who staged unopposed landings in Korea. The Russians were revitalised by the arrival of Admiral Stepan Makarov and were able to achieve some degree of success against the Japanese, but on 13 April Makarov's flagship, the battleship Petropavlovsk struck a mine; Makarov was among the dead. His successors failed to challenge the Japanese Navy, and the Russians were effectively bottled up in their base at Port Arthur. By May, the Japanese had landed forces on the Liaodong Peninsula and in August began the siege of the naval station. On 9 August, Admiral Wilgelm Vitgeft, commander of the 1st Pacific Squadron, was ordered to sortie his fleet to Vladivostok, link up with the Squadron stationed there, and then engage the Imperial Japanese Navy (IJN) in a decisive battle. 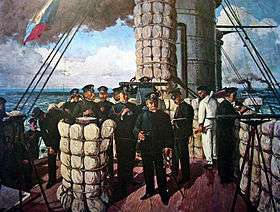 Both squadrons of the Russian Pacific Fleet would ultimately become dispersed during the battles of the Yellow Sea on 10 August and the Ulsan on 14 August 1904. What remained of Russian naval power would eventually be sunk in Port Arthur. With the inactivity of the First Pacific Squadron after the death of Admiral Makarov and the tightening of the Japanese noose around Port Arthur, the Russians considered sending part of their Baltic Fleet to the Far East. The plan was to relieve Port Arthur by sea, link up with the First Pacific Squadron, overwhelm the Imperial Japanese Navy, and then delay the Japanese advance into Manchuria until Russian reinforcements could arrive via the Trans-Siberian railroad and overwhelm the Japanese land forces in Manchuria. As the situation in the Far East deteriorated, the Tsar (encouraged by his cousin Kaiser Wilhelm II), agreed to the formation of the Second Pacific Squadron. It would consist of five divisions of the Baltic Fleet, including 11 of its 13 battleships. The squadron departed on 15 October 1904 under the command of Admiral Zinovy Rozhestvensky. The Second Pacific Squadron sailed through the North Sea. As there were rumours of Japanese torpedo boats in the North Sea, several Russian ships fired upon British fishing trawlers off the Dogger Bank, causing the Royal Navy to shadow the Russian fleet until a diplomatic agreement was reached. Barred by Britain from using the Suez Canal, the Russians sailed around Africa, and by April and May 1905 had anchored at Cam Ranh Bay in French Indochina (now Vietnam). The voyage was long and arduous, and the morale of the crews plummeted. 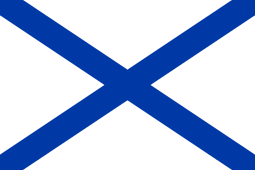 The Russians had been ordered to break the blockade of Port Arthur, but the city had already fallen on 2 January, so the Russian port of Vladivostok became the objective. 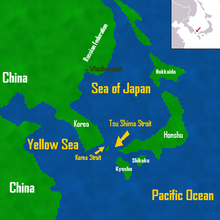 The Russians could have sailed through any one of three possible straits to enter the Sea of Japan and reach Vladivostok: La Perouse, Tsugaru, and Tsushima. Admiral Rozhestvensky chose Tsushima in an effort to simplify his route. Admiral Tōgō, based at Busan, also believed Tsushima would be the preferred Russian course. The Tsushima Strait is the body of water eastward of the Tsushima Island group, located midway between the Japanese island of Kyushu and the Korean Peninsula, the shortest and most direct route from Indochina. The other routes would have required the fleet to sail east around Japan. 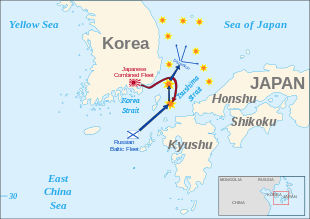 The Japanese Combined Fleet and the Russian Second and Third Pacific Squadrons, sent from the Baltic Sea, would fight in the straits between Korea and Japan near the Tsushima Islands. Because of the 18,000-mile journey, the Russian fleet was in relatively poor condition for battle. Apart from the four newest Borodino-class battleships, Admiral Nebogatov's 3rd Division consisted of older and poorly maintained warships. Overall neither side had a significant maneuverability advantage. The long voyage, combined with a lack of opportunity for maintenance, meant the Russian ships were heavily fouled, significantly reducing their speed. The Japanese ships could sustain 15 knots (28 km/h), but the Russian fleet could reach just 14 knots (26 km/h), and then only in short bursts. Korea and Tsushima Straits and Tsushima Islands. Map showing the routes of both fleets. Turning in sequence meant that each ship would turn one after the other whilst still following the ship in front. Effectively each vessel would turn over the same piece of sea (this being the danger in the maneuver as it gives the enemy fleet the opportunity to target that area). Tōgō could have ordered his ships to turn "together", that is, each ship would have made the turn at the same time and reversed course. This maneuver, the same one effected by the French-Spanish fleet at Trafalgar, would be quicker but would have disrupted the sequence of the battleline and caused confusion by altering the battle plans and placing the cruisers in the lead. This was something Tōgō wished to avoid. In the night, thick fog blanketed the straits, giving the Russians an advantage. At 02:45 Japan Standard Time (JST), the Japanese auxiliary cruiser Shinano Maru observed three lights on what appeared to be a vessel on the distant horizon and closed to investigate. These lights were from the Russian hospital ship Orel, which in compliance with the rules of war, had continued to burn them. At 04:30, Shinano Maru approached the vessel, noting that she carried no guns and appeared to be an auxiliary. The Orel mistook the Shinano Maru for another Russian vessel and did not attempt to notify the fleet. Instead, she signaled to inform the Japanese ship that there were other Russian vessels nearby. The Shinano Maru then sighted the shapes of ten other Russian ships in the mist. The Russian fleet had been discovered, and any chance of reaching Vladivostok undetected had disappeared. Wireless telegraphy played an important role from the start. At 04:55, Captain Narukawa of the Shinano Maru sent a message to Admiral Tōgō in Masampo that the "Enemy is in square 203". By 05:00, intercepted wireless signals informed the Russians that they had been discovered and that Japanese scouting cruisers were shadowing them. Admiral Tōgō received his message at 05:05, and immediately began to prepare his battle fleet for a sortie. The final sentence of this telegram became famous in Japanese military history. The Russians sailed from south southwest to north northeast; "continuing to a point of intersection which allowed only their bow guns to bear; enabling him [Tōgō] to throw most of the Russian batteries successively out of bearing." The Japanese fleet steamed from northeast to west, Tōgō ordered the fleet to turn in sequence, which enabled his ships to take the same course as the Russians, although risking each battleship consecutively. Although Tōgō's U-turn was successful, Russian gunnery had proven surprisingly good and the flagship Mikasa was hit 15 times in five minutes. Before the end of the engagement she was struck 15 more times by large caliber shells. Rozhestvensky had only two alternatives, "a charge direct, in line abreast", or to commence "a formal pitched battle." He chose the latter, and at 14:08, the Japanese flagship Mikasa was hit at about 7,000 metres, with the Japanese replying at 6,400 meters. Superior Japanese gunnery then took its toll, with most of the Russian battleships being crippled. At night, around 20:00, 21 destroyers and 37 Japanese torpedo boats were thrown against the Russians. The destroyers attacked from the vanguard while the torpedo boats attacked from the east and south of the Russian fleet. The Japanese were aggressive, continuing their attacks for three hours without a break, as a result during the night, there were a number of collisions between the small craft and Russian warships. The Russians were now dispersed in small groups trying to break northwards. By 23:00, it appeared that the Russians had vanished, but they revealed their positions to their pursuers by switching on their searchlights – ironically, the searchlights had been turned on to spot the attackers. The old battleship Navarin struck a mine and was compelled to stop, she was consequently torpedoed four times and sunk. Out of a crew of 622, only three survived, one to be rescued by the Japanese and the other two by a British merchant ship. The Japanese fleets had practised gunnery regularly since the beginning of the war, using sub-calibre adapters in their guns and gaining more experience than the Russians. The Japanese also used mostly high-explosive shells with shimose (melinite), which was designed to explode on contact and wreck the upper structures of ships. The Russians used armour-piercing rounds with small guncotton bursting charges and unreliable fuses. Japanese hits caused more damage to Russian ships relative to Russian hits on Japanese ships, setting the superstructures, the paintwork and the large quantities of coal stored on the decks on fire. (The Russian fleet often bought low-quality coal at sea from merchant vessels on most of their long voyage due to the lack of friendly fuelling ports). The Russian Navy lost four of its eight cruisers during the battle, three were interned by the Americans, with just one reaching Vladivostok. Vladimir Monomakh and Svetlana were sunk the next day, after the daylight battle. The cruiser Dmitrii Donskoi fought against six Japanese cruisers and survived; however, due to heavy damage she was scuttled. 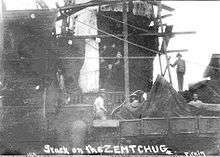 Izumrud ran aground near the Siberian coast. 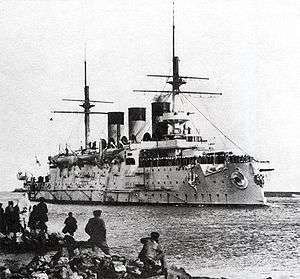 Three Russian protected cruisers, Aurora, Zhemchug, and Oleg escaped to the U.S. naval base at Manila in the then-American-controlled Philippines where they were interned, as the United States was neutral. The armed yacht (classified as a cruiser), Almaz, alone was able to reach Vladivostok. Imperial Russia also lost six of its nine destroyers in the battle, had one interned by the Chinese, with two escaping to Vladivostok. They were – Buyniy ("Буйный"), Bistriy ("Быстрый"), Bezuprechniy ("Безупречный"), Gromkiy ("Громкий") and Blestyashchiy ("Блестящий") – sunk on 28 May, Byedoviy ("Бедовый") surrendered that day. Bodriy ("Бодрый") was interned in Shanghai; Grosniy ("Грозный") and Braviy ("Бравый") reached Vladivostok. The battle had a profound cultural and political impact upon Japan. It was the first defeat of a European power by an Asian nation in the modern era, It also weakened the notion of white superiority that was prevalent in some Western countries. 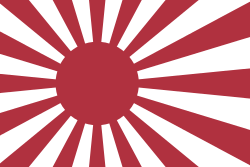 The victory established Japan as the sixth greatest naval power while the Russian navy declined to one barely stronger than that of Austria-Hungary. Britain's First Sea Lord, Admiral Fisher, reasoned that the Japanese victory at Tsushima confirmed the importance of large guns and speed for modern battleships; in October 1905 the British started the construction of HMS Dreadnought, which upon her launching in 1906 began a naval arms race between Britain and Germany in the years before 1914. The British and Germans were both aware of the potentially devastating consequences of a naval defeat on the scale of Tsushima. Britain needed its battle fleet to protect its empire, and the trade routes vital to its war effort. Winston Churchill, then First Lord of the Admiralty, described British Admiral John Jellicoe as "the only man who could lose the war in an afternoon." German naval commanders, for their part, understood the importance Kaiser Wilhelm II attached to his navy and the diplomatic prestige it carried. As a result of caution, the British and German fleets met in only one major action in World War I, the indecisive Battle of Jutland. ↑ Sterling, Christopher H. (2008). Military communications: from ancient times to the 21st century. ABC-CLIO. p. 459. ISBN 1-85109-732-5. The naval battle of Tsushima, the ultimate contest of the 1904–1905 Russo-Japanese War, was one of the most decisive sea battles in history. ↑ Naval War College Press (U.S.), ed. (2009). Joint Operational Warfare Theory and Practice and V. 2, Historical Companion. Government Printing Office. p. V-76. ISBN 1-884733-62-X. In retrospect, the battle of Tsushima in May 1905 was the last "decisive" naval battle in history. ↑ Morris, Edmund (2001). Theodore Rex. ISBN 0-394-55509-0. ↑ Sondhaus 2001, p. 188. ↑ Sondhaus 2001, p. 189. 1 2 Sondhaus 2001, p. 190. ↑ Sondhaus 2001, p. 191. 1 2 3 4 Willmott 2009, p. 118. 1 2 Willmott 2009, p. 119. ↑ "the Impact of the Russo-Japanese War in Asia". The American Forum for Global Education. Archived from the original on 2003-01-06. Retrieved 2010-04-25. 1 2 Sondhaus 2001, p. 192. Connaughton, Richard M. The War of the Rising Sun and Tumbling Bear: A Military History of the Russo-Japanese War, 1904-5 (1991). Grant, R. (1907). Before Port Arthur in a Destroyer, The Personal Diary of a Japanese Naval Officer. London: John Murray.